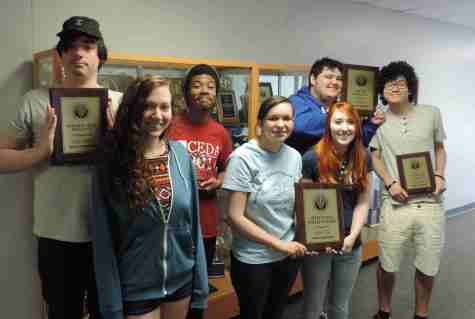 KCKCC debate national champions once again – Welcome to Wyandotte Daily! The Kansas City Kansas Community College Debate Team has had a busy few weeks. And as the group celebrates the end of their season, they celebrate once again as national champions. KCKCC won its 11th consecutive National Title in Debate at the Phi Rho Pi Community College National Tournament in Denver, Colo. There were 100 teams that competed in the Parliamentary Debate Division at the tournament, and when all competition was completed, KCKCC was on top. In addition, the team of Matt Casas and Anthony Joseph won gold in the same division, and assistant coach John Bretthauer, a KCKCC alum, received a coaching fellowship award. Parliamentary Debate is a different style of debate than KCKCC is used to at tournaments. Instead of preparing for a single argument in advance of the tournament, debaters are given 15 minutes to prepare for the round and the topics continually change. What makes the win even more surprising is that this is the first time Casas and Joseph have debated as a team. Casas has been successful throughout the 2013-14 season with partner Brian Gonzaba. The pair even qualified to the National Debate Tournament, tying with Harvard University for fifth overall in the national rankings. KCKCC is the first community college in NDT history to qualify for three consecutive years and KCKCC was the top community college in overall final standings. The tournament was March 28-31. Joseph said the biggest challenge of the tournament was learning how to adapt to the judges and make adjustments in each round. In addition to Casas and Joseph, Ashley Shockley, Homeschool and Chris Miles and Michael Smith, both graduates of Fort Osage High School in Independence, competed at Phi Rho Pi. What made Shockley’s experience a little different is that she was paired with another debater from El Camino College in California for the Parliamentary Debate rounds. Before Phi Rho Pi, KCKCC competed in the CEDA Nationals, which is open to any two or four year school. Katie Ford, Fremont High School in Fremont, Neb. and Alex Glanzman, Lawrence High School, made it to the top 32 before being eliminated by the University of Oklahoma. Casas and Gonzaba were eliminated in the top 16, also by OU. Overall, KCKCC won the National Title in the community college division, the ninth time in the last 11 years. Additional awards were given to Ford, 9th speaker and Casas, CEDA All American. This is the first time that KCKCC has had anyone in the top 20 speakers at the CEDA Nationals.